In the winter of 2000, Louise Steinman set out to attend an international Bearing Witness Retreat at Auschwitz-Birkenau at the invitation of her Zen rabbi, who felt the Poles had gotten a “bum rap.” A bum rap? Her own mother could not bear to utter the word “Poland,” a country, Steinman was taught, that allowed and perhaps abetted the genocide that decimated Europe’s Jewish population, including members of her own extended family. As Steinman learns more about her lost ancestors, though, she finds that the history of Polish-Jewish relations is far more complex. Although German-occupied Poland was the site of horrific Jewish persecution, Poland was for centuries the epicenter of European Jewish life. After the war, Polish-Jewish relations soured. For Poles under Communism, it was taboo to examine or discuss the country’s Jewish past. Among Jews in the Diaspora, there was little acknowledgment of the Poles’ immense suffering during its dual occupation. Steinman’s research leads her to her grandparents’ town of Radomsko, whose eighteen thousand Jews were deported or shot during the Nazi occupation. 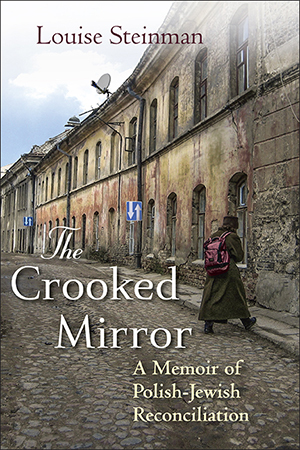 As she delves deeper into the town’s and her family’s history, Steinman discovers a prewar past where a lively community of Jews and Catholics lived shoulder to shoulder, where a Polish Catholic painted the blue ceiling of the Radomsko synagogue, and a Jewish tinsmith roofed the spires of the Catholic church. She also uncovers untold stories of Poles who rescued their Jewish neighbors in Radomsko and helps bring these heros to the light of day. Returning time and again to Poland over the course of a decade, Steinman finds Poles who are seeking the truth about the past, however painful, and creating their own rituals to teach their towns about the history of their lost Jewish neighbors. This lyrical memoir chronicles her immersion in the exhilarating, discomforting, sometimes surreal, and ultimately healing process of Polish-Jewish reconciliation. "Steinman's elegiac book is a powerful reminder of how ideologies can become 'crooked mirror[s]' that distort reality and destroy lives, cultures and nations." Cinders drifted over the heads of family and friends--fi re season in Southern California. The rabbi sang so ecstatically from the Song of Songs, some of the wedding guests wondered if he was on acid. It was 1988, my second marriage, my husband’s third. In the past, neither of us had considered a religious ceremony. But all four of our parents were then alive, and we knew it would give them sweet pleasure to see us married under the chupa, the traditional Jewish wedding canopy. When we began planning, knowing our ambivalence about tradition, a friend directed us to Don Singer, “the Zen Rabbi of Malibu.” Don met us at the door of his house with a parrot on his shoulder. He was white-haired, handsome; laugh lines radiated from bright blue eyes. We warmed immediately to his unorthodoxy, his innate joie de vivre. Don Singer really was a Zen rabbi. His understanding of Buddhism harmonized with his embrace of Hasidic wisdom. His congregation gathered for Shabbat and High Holy Day services in the garden behind the Los Angeles Zen Center, located in one of the city’s poorest neighborhoods. On Rosh Hashanah, blasts from the traditional ram’s horn (shofar) mingled with catchy tunes from an ice cream truck and the beat of salsa from boom boxes. In Rabbi Singer’s eclectic, roaming congregation, I found a contemplative home for my unaffiliated and long-estranged Judaism. Sometimes at his services, Don spoke about his experiences in Poland. Every winter for five years in a row, Rabbi Singer had served as the principal rabbi for the Bearing Witness Retreat at Auschwitz-Birkenau, an interfaith gathering organized by the Zen Peacemaker Order. In one of his Friday night talks, Rabbi Singer mentioned “Polish- Jewish reconciliation.” He felt a responsibility to bring Poles and Jews together. I couldn’t imagine why. I fumed . . . a bum rap? Like so many others, I erroneously assumed the Nazis located their extermination camps in Poland because they expected the Poles would be willing collaborators. I’d heard that Poles murdered Jews even after the war ended. The infamous July 1946 pogrom in the town of Kielce, Poland, against Jews who’d returned from the camps, caused mass panic among those Polish Jews who’d survived the war. Forty Jews were murdered in Kielce, despite a large presence of police and army militia. The violence raged on for more than five hours. “Polish-Jewish reconciliation” had the ring of a bad joke, like the premise of Philip Roth’s novel Operation Shylock, in which Israeli Jews emigrate back to Poland in a reverse Diaspora. For my family--as for so many other American Jews of Polish descent--Poland was a black hole, a gnawing void. I took note that many, if not most, of my Jewish friends had family ties to Poland. An estimated 80 percent of American Jews are of Polish Jewish descent. There was scant generosity in their feelings about Poland; always dependable heat. Most harbored more bitterness toward Poland than they did toward Germany, a fact that I never questioned as odd, misplaced. The Jews may have once been part of Poland’s body and soul, but they’d been excised, cast out. My own mother could barely utter the word Poland. Her grief at the loss of unnamed family in Poland during the Holocaust rendered painful even the sound of where it happened. It was a given that Poland was a country full of people who hated Jews, who allowed and perhaps even abetted an unspeakable genocide on their soil. Bitterness calcified, and in my home and among my generation of comfortable suburban Los Angeles Jewish kids, the very idea of Poland resonated anguish and betrayal in a way it did not for other Americans. MY MOTHER’S PARENTS EMIGRATED from Poland to the United States in 1906. Back beyond that, silence. Even as a child and without knowing why, the absence of family history on my maternal side was a gap, an ache. My father’s mother, my Russian grandmother, was a gifted storyteller. Rebecca (Becky) Steinman read Hebrew and spoke Yiddish, Russian, Ukrainian, Polish, and heavily accented English. Becky’s stories of flight and migration fascinated me. It was a Polish farmer, she said, who--in 1921 with a civil war raging--smuggled my grandmother with her two children out of Ukraine and into Poland on his horse-drawn cart covered with a bed of straw. In recompense, she gave the Polish farmer the family samovar. I knew that my mother’s mother, Sarah Konarska Weiskopf, came from a place in Poland called Czestochowa, and that my mother’s father, Louis Weiskopf, came from a town nearby called Radomsk. The word tickled me as a child. Ra-dumpsk! I imagined Radomsk as an impoverished backwater, like Dogpatch in those L’il Abner cartoons we read on Sunday morning. I remembered Grandma Sarah as an exhausted old woman who lived in a tiny apartment on Ocean Parkway in Brooklyn, tied her wisps of white hair into a bun secured with bobby pins, and, to my eternal fascination, hid rolls of dollar bills in her oven. Grandpa Louis died before I was born. Four of my generation--including me--were his namesakes. Growing up in 1950s Los Angeles, in an orderly grid of postwar stucco houses, it wasn’t as if I was surrounded by kids who could recite their ancestors back to the Mayflower. Had I queried my playmates, I would have learned that almost all of them had gaping holes in their family histories. My father, like many others on our block, had returned from the war--in his case, combat in the Pacific. The priorities were building economic security, starting families, launching businesses. My dad’s new pharmacy in Culver City was open 9:00 a.m. to 9:00 p.m., and he was always there. My mother had three young children to supervise, including my sister who had polio. Being severed from one’s family past wasn’t supposed to matter. But at least I knew the names of my grandparents. I thought it odd that my mother, if asked, didn’t know the names of hers. Nor was she eager to try and fill in the blanks. If asked about her parents’ families, names of her grandparents, uncles, aunts, she would only say, “They didn’t make it out of Poland.” Her huge gray-blue eyes watered, her voice constricted. She didn’t want to talk about it. An incident when I was eight shifted the axis of my world. I was watching my favorite TV show in the family room. My usually permissive mother barged in, abruptly switched the channel, and issued an order: “You watch this!” Then she left the room. It was a black-and-white documentary on the camps, the naked bodies stacked like cordwood, the emaciated striped-suited survivors unrecognizable as human beings. I heard my mother sobbing on the other side of the closed kitchen door. The next day I took odd and spontaneous revenge--ripping up the pages on Hitler in volume H of the Encyclopedia Americana shelved next to my desk in the fourth-grade classroom at La Ballona Elementary. A classmate--Jewish, no less--betrayed me. Later, after recess, while I lined up with the rest of my class, my teacher handed me the mutilated book and grimly dispatched her gold-star student to the principal’s office. From a framed portrait over the principal’s desk, President Eisenhower bore silent witness to my interrogation. “Why this page? Why not this one” I wanted to tell the principal that those dead people on television could be my unnamed relatives--great-aunts, uncles, cousins--in Radomsk, the town in Poland with the funny name. But I could not coax a single word to come out of my mouth. My mother was summoned. She conferred with the principal behind the frosted glass door, emerging with red, wet eyes. She took my hand and we walked outside into the bright glare of the afternoon. We drove home in silence. Low voices rumbled in my parents’ room that night. My mother did not apologize for having made me watch the program about the camps, but she did let me stay home the next day, as if I had a fever. We never discussed the torn pages of the H encyclopedia volume. There were feelings neither of us could put into words. IT WAS RABBI SINGER who summoned me to engage with that ache about my family’s missing past in Poland. I was not eager to go. Wasn’t a week in Auschwitz a form of masochism? A communal identity based on a legacy of victimhood made me uneasy. The idea of meditating on the train tracks at Auschwitz- Birkenau terrified me. I accepted Rabbi Singer’s invitation with a mixed sense of anticipation and dread. I took comfort knowing that he would be there. The retreat was almost ten months away. I knew that Poland had been partitioned in 1795--Prussia taking the areas in the west, Austria the south, Russia the east. It’s one thing, however, to read about a country’s historical fate at the hands of occupying powers and another thing entirely to see that it has vanished from the map. My first history lesson about Poland sank in: it has no natural borders. No major mountains or rivers define its physical edge. Catastrophic geography plus ruthless neighbors equals invasion, occupation, oppression. In 1918, at the Paris Peace Conference following World War I, Poland reemerged as a state after turbulent diplomacy. But during the 123 years (1795 to 1918) it was erased from the map of Europe, and later under Nazi and then Communist subjugation, Poland existed only in memory and through the verses of its exiled poets, in the nocturnes of its composers. The country became, as the great Polish poet Adam Zagajewski notes, “a chimera.” Without a government, Poland’s artists were its spiritual rulers, providing a sense of national identity. For the citizens of this noncountry that had disappeared at the end of the eighteenth century, a strong independent Poland existed only as a state of mind. A French journalist referred to this conceptual Poland as “un pays dans la t’te,” a country in one’s head. Until I went to Poland, I hadn’t realized that it was a country in my head too.